The central northern USA is getting another shot of cold from the polar vortex anchored over Hudson Bay. Tomorrow with 6-8cm. of snow expected over central Missouri-Illinois it will be the first Easter snow since 1917. The usual "Where's the warming" is likely to be heard. While 3-4" isn't too crazy, the repeated nature of this pattern has been! Islip on the east end of Long Island saw its snowiest March on record, in fact, with about 31" for the month. If the second April event produces 4"+, it would certainly be "wow" worthy (one April event is!). .. while here in Ireland a 48 hr blizzard has left the forecast .. Extent is falling as normal even when total snow remains high. For context, we have about the same extent as we did 12/1/2017, however, the volume over the same scope of coverage is about 3X the depth of what it was at that time! E.G., if we see conditions that are beneficial to retention as we did last year (but with even more SWE this time around), I think there is actually a decent shot that we are still above 4,000 KM^3 of SWE come 4/15. At that point the difference vs. normal becomes a chasm of many many standard deviations (6 7 or 8 above normal I would think)?, with 98-2011 average SWE for 4/15 at approximately 2,250 KM^3. I think May is going to be the month of massive melt this year, not April, and we could still be above 3,500KM ^3 of SWE by 4/30. I would hazard to guess the practical implications of this will be a recurrence of the worsening annual springtime floods across Texas/Louisiana, as well as other random regions of the globe. I would also guess that the resilience on display in Quebec will lead to May snows in New England and maybe even the Mid-Atlantic states. Does the below graph actually show what I ascribe to it in the annotations? That is, is seasonal snowfall's first maximum determined by rising insolation/the end of winter, while the second maximum (in most years) is driven by the first wave of spring melt -> onset effects thereafter? (latent heat release from melting ice/snow is clearly the driving force behind the enormous and unprecedented 500MB blocking aka "Arctic Amplification" and so as it occurs, the Arctic dumps its cold into the mid-latitudes and the cycle repeats until the cold sources are exhausted). It is important to separate the noise from useful information when it comes to these changing graphs. If, in fact, this explains the synchronicity to seasonal anomalies, it would stand to reason that as we see higher accumulated SWE, the rebound effects of each melt cycle as spring starts are progressively MORE impactful until we see widespread bare ground, due to the background state of deeper snow. Combined with the lack of Arctic sea ice, this allows quicker "recharging" of the springtime snowpack than ever before, after each episode of melt. Finally... I wonder if we see another hemispheric maximum after 4/1? I think it may actually be possible...! The snowfall forecasts for the next 10 days show massive falls over the mid-latitudes. The amounts across the U.S. are unprecedented, and will be largely transient, but will bolster gains across Quebec, which saw a bit of melt after a very brief period of heat/moisture this week. And, finally, there should be sustained large falls across the northern tier of Asia, especially across NW Siberia. I wonder if an imminent flip in seasonal duration between Bering and Hudson Bay could be the driver behind ultimate possible reglaciation? It is interesting to note where the cold normally located in Bering has been displaced and it has been almost entirely over North America, centered precisely over Hudson Bay. Of course Hudson Bay is likely to melt out regardless, but if this trend accelerates in the coming years, we could see substantially more snow accumulate in winter and spring in adjacent regions to HB, exacerbating Bering's warming further as the thermal gradient with ever-warmer strait warmers are "vacuuming" the North Pacific into the Arctic in the absence of winter sea ice. This will ultimately spill into both Beaufort and Chukchi. I hesitate to imagine what impact on snowfall will be at that point... I suppose historically it has been sufficient to trigger re-glaciation of the continents. Real-time actual data is more reliable than low-resolution climate models that miss many potential variables, as Hansen's work shows. And the recent rapid rise in snowfall totals has certainly happened before. Occam's Razor indicates this is how we enter ice ages! I wonder if an imminent flip in seasonal duration between Bering and Hudson Bay could be the driver behind ultimate possible reglaciation? I suppose historically it has been sufficient to trigger re-glaciation of the continents. Occam's Razor indicates this is how we enter ice ages! Glaciation happens when snow survives the summer in locations where it didn't use to survive. More snow falling does not trigger glaciation. Here is some basic reading for you. Especially recommended, points  to  from the first paragraph 1. We predict that a carbon release from fossil fuels or methane hydrate deposits of 5000 Gton C could prevent glaciation for the next 500,000 years, until after not one but two 400 kyr cycle eccentricity minima. Nucleation of an ice sheet from an interglacial climate is perhaps the easiest part of the glacial cycle to understand and forecast. grows to full glacial size at very close to this insolation value. And Fig. 2 and 3, plus an alternative reading of the current snow depth situation. Abstract. The Canadian Sea Ice and Snow Evolution (CanSISE) Network is a climate research network focused on developing and applying state of the art observational data to advance dynamical prediction, projections, and understanding of seasonal snow cover and sea ice in Canada and the circumpolar Arctic. Here, we present an assessment from the CanSISE Network on trends in the historical record of snow cover (fraction, water equivalent) and sea ice (area, concentration, type, and thickness) across Canada. We also assess projected changes in snow cover and sea ice likely to occur by mid-century, as simulated by the Coupled Model Intercomparison Project Phase 5 (CMIP5) suite of Earth system models. The historical datasets show that the fraction of Canadian land and marine areas covered by snow and ice is decreasing over time, with seasonal and regional variability in the trends consistent with regional differences in surface temperature trends. In particular, summer sea ice cover has decreased significantly across nearly all Canadian marine regions, and the rate of multi-year ice loss in the Beaufort Sea and Canadian Arctic Archipelago has nearly doubled over the last 8 years. The multi-model consensus over the 2020–2050 period shows reductions in fall and spring snow cover fraction and sea ice concentration of 5–10 % per decade (or 15–30 % in total), with similar reductions in winter sea ice concentration in both Hudson Bay and eastern Canadian waters. Peak pre-melt terrestrial snow water equivalent reductions of up to 10 % per decade (30 % in total) are projected across southern Canada. I think the echo chamber of incoherent/inaccurate climate modeling is extremely problematic. Accumulated SMB since 9/1 in Greenland is minimal in "cold" areas and the "cold" areas are in fact where the sheet is generally losing mass. The blues? They are on the coast, where it isn't that cold, but the amount of snow has become increasingly prolific. Arguing against a peer reviewed paper with little more than a chart and a hunch is a fools argument. Those "peers" are byproducts of unbrindled consumerism, which is a direct creation of the supposedly "noble" universities where they are educated. Climate science in liberal society is the equivalent of alchemy in the 1300s. Where do you think the CEOs of Exxon go to school / do you actually think that their friends on the boards/etc would produce anything that refutes a status quo based on low-resolution BS? Besides real-world graphs of actual ongoing change, the work of Hansen clearly shows those projections to be a farce. PS latest data from Canadians shows North America is again up in SWE for 4/3 and has once again almost reached its previous maximum. Christ almighty! Going to go elsewhere to read. Yes Neven the Rutgers NH snow cover figure for March 2018 was 41.83 million km2. (Anomaly of +1.7 million km2). Comparison with last 2 years attached. +ve departures were over New England & US northern plains, eastern and SE Europe. eastern Tibet. -ve departures were over Turkey and a belt stretching from southern Kazakhstan to Mongolia. North America has now reached its maximum seasonal SWE as of 4/4. Eurasia beginning to drop more substantially. Thank you for digging into this... obviously something is actually happening...! I wonder if a lack of March sea ice in the Bering Sea is a tipping point for the system, as insolation / water vapor impacts begin to cascade? It's definitely very interesting. I want to try and find some expert to see what he/she thinks. I think it illustrates how problematic the increase could become over time. The sheer % rise year over year in 2018 is something that is impossible with sea ice because the starting point for NH snow is much lower. But what about with even more sea ice loss? Does that lead to rapid recurring annual wintertime double digit % losses beginning in the Arctic while we see the same y-o-y increase between 2017->2018 in snowcover also begin to repeat with more frequency? As the GHG load on the atmosphere increases I think this is a very plausible solution as it is the most effective way for the increased dissipation of planetary heat under ever-increasing GHGs. The increase in heat also comes with an increase in the efficiency of the heat *engine* which is the coupled continental ice sheet-sea ice albedo system. When the planet is within an ice age, the system responds rapidly to losses in sea ice (i.e. albedo), and with more heat distributed each and every year, *when major extant ice sheets exist* the continents compensate until the annual increase in heat is minimized and the heat engine loses some steam. Thus I think we must look at the *derivative* of increase rather than the increase itself as another important factor in determining change. When the system is effectively resolving more heat, planetary temps drop, and sea ice begins to form once more. But as we see several more decades of guaranteed major sustained annual GHG increases, that is not going to happen. Instead, the extra heat is going to be resolved by the destruction of most polar sea ice with new continental ice sheets probably forming by the 2030s. Perhaps the amount of heat injected / natural feedbacks thereafter could be sufficient to plunge the planet into something worse than the last major maximum. This will have the fortunate side effect of shutting off the primary mechanism behind the GHG releases, however. Food for thought: current record low March NHEM ice volume is approximately 20,000 KM^3. This has dropped from 27,000 KM ^ 3 in 2002 (26%). This March saw a maximum SWE near 4,500 KM^3. That is about 50% above the normal maximums observed within the past few years. It is a stand out but as years like 2007 and 2012 have shown WRT sea ice, black swans may start as isolated ducklings but they quickly turn into angry honking flocks. If we roll forward based on a 30% decrease in March ice volume over the next 15 years (probably reasonable based on comp w/02), we end up at 14,000 KM ^ 3 of ice. Looking at SWE, another 50% increase from 2018 would be approximately 6,750KM ^ 3. Again, we pass 10,000 KM ^3. What if another major tipping-point is hemispheric snow-water-equivalent surpassing its total volume of sea ice? We seemingly have answers behind what happened at the end of all the previous ice ages, yet the actual question of onset is always beset by silly thoughts re: solar cycles etc. These are all coincidental to TIPPING POINTS when extant continental ice sheets co-exist with sea ice. Well, we first need to see whether 2018 is an outlier, and how much longer than normal that snow will linger. I don't know if we can have an ice-free Arctic due to AGW, while at the same time new continental ice sheets start to form. At some point all that extra precipitation starts to fall as rain instead of snow. I'm interested to see if this is a negative feedback on summer ice melt. Intuition says it will be, but the Arctic has this nasty habit of doing counter-intuitive things. It is a negative feedback of WINTER ice melt. Summer may precipitate the same impact but the snow is falling in March precisely because all that extra precipitation ISN'T falling as rain. And I believe it is derived from the lack of high-latitude sea ice/abundance of increasing polar oceanic heat content. That is an interesting question. Let's see if we can quantify this. For March, it was about 600 Gton above normal. However, snow cover for March was some 42 million km2 from Rutger's snow lab, as reported by Niall, above. That is 600 Gton/42 million km2 = 14 kg/m2. That is only 1.4 cm of ice, folks. It will melt out in a day or two under the right weather conditions. So, in my opinion, the excess snow water equivalent (SWE) anomaly this year is just a little blimp on the scale, and it won't make any difference for the melting season. It will all be gone in July, guaranteed. Just a couple of thoughts, for an ice field to grow it's going to have to be high enough to have late spring/summer snow and large enough to create it's own weather. So I'm thinking it has to be remote from the ocean and with no significant hills/mountains between it and the ocean. I was wondering though about the snow cover extent on the 040418 chart. It looks far further north then satellite imagery and NOAA snow chart indicate for the area west of lake Michigan across the Plains. I haven't looked elsewhere on the globe to see if there are any other discrepancies. Neven thank you for the animations. In terms of extent 2018 seems to be with the high years in North America and with the low years in Siberia, but not exceptional in any case. As for the quoted post, I don't even know where to begin (again). Yes we might get more snow depth because of more open water. Will we get more snow extent? It doesn't seem like it. Will the snow last longer on the ground? My research above, Rob's calculation above, and plain old common sense regarding a warming climate say a strong no. Does the snow create its own weather? No. The heat comes from elsewhere to melt the snow. An elsewhere where GHGs drive up temps, and there is no albedo effect. The snow is not protected from that heat. "When the planet is within an ice age, the system responds rapidly to losses in sea ice (i.e. albedo), and with more heat distributed each and every year, *when major extant ice sheets exist* the continents compensate until the annual increase in heat is minimized and the heat engine loses some steam." - so during ice ages the proposed cycle is loss of sea ice leading to growth in continental ice sheets? I say pure fantasy. Sea ice does not shrink while increased glaciation is ongoing, as it is too cold for that. To claim otherwise requires extraordinary proof. "When the system is effectively resolving more heat, planetary temps drop, and sea ice begins to form once more." - I concur that perhaps the snow is a way for the system to shed some extra heat. But it doesn't cool the system below where it started. It uses some of the excess energy for precipitation, that's all. "But as we see several more decades of guaranteed major sustained annual GHG increases, that is not going to happen. Instead, the extra heat is going to be resolved by the destruction of most polar sea ice with new continental ice sheets probably forming by the 2030s. Perhaps the amount of heat injected / natural feedbacks thereafter could be sufficient to plunge the planet into something worse than the last major maximum." This defies all common sense. In this theory too much heat causes the continental ice sheets to form. But the snow feedback is not strong enough, cannot be strong enough for that. If it snowed over the whole earth including oceans and equator, and that snow lasted extra time, then perhaps somehow you could get a strong feedback. Pure fantasy. "We seemingly have answers behind what happened at the end of all the previous ice ages, yet the actual question of onset is always beset by silly thoughts re: solar cycles etc. These are all coincidental to TIPPING POINTS when extant continental ice sheets co-exist with sea ice." Indeed we have answers. Milankovitch cycles. Summers become shorter and cooler, snow lasts on the ground, you get an ice age. Snow depth is not a feedback in terms of albedo, neither is sea ice volume. The albedo effect is achieved by area multiplied by insolation. NHEM sea ice during insolation season equinox to equinox is currently ~1.5 million km2 less than it was in the 1980s. 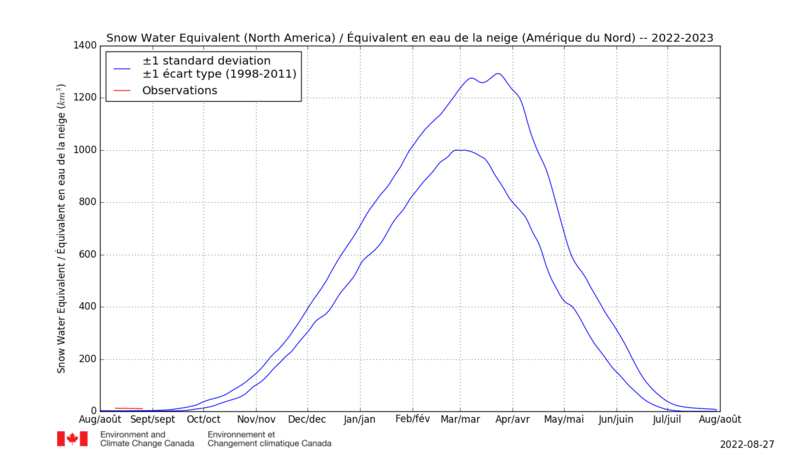 Is snow extent higher by 1.5 million km2 sustained during the whole season? No. So where is the feedback? Nowhere to be found. My only serious question, as this is a science forum, is why this "glaciation due to a warming climate" theory is popping up again and again almost on a daily basis. Sorry if I sound harsh, but this does test one's patience, especially as the theory's proponent does seem well versed in science. Personal resolution: I will try to refrain from posting rebuttals on the subject from now on. If lack of arctic sea ice causes northern glaciation, what were the arctic camels, rhinos, alligators and turtles subsisting on? I think heavy clouds, fogs and mists kept the far north toasty even in those long months when the sun wasn't shining. Why wouldn't a similar situation present itself in the near future when we again have blue arctic seas? bbr2314 is an explorer who wants to be the first and only to discover a new continent. I'm not really into his theory either, but I do appreciate someone looking at the snow intently, as the increased snow fall is highly likely caused by sea ice retreat, which is 1) a consequences that can be bothersome, costly, and even cost lives, and 2) might be a negative feedback of sorts. If it wasn't for bbr2314's harping, I probably wouldn't have noticed that the SWE situation was out of the ordinary (my recollection is that it has been high for years due to widespread data artifacts over the Tibetan plateau, but not this high). I'm still not 100% sure the graphs are correct, but they likely are. The Canadian ones look dodgy because of tat distribution map with the purple over said Tibetan plateau, and also because I didn't receive any reply to my queries, which suggests no one is really looking after the website (and perhaps the data). But the Finnish plots and graphs look much more serious and up-to-date, if only for the fact that the NSIDC used them for their latest monthly summary. If local observation is of any use at all. Here in Southwestern Ontario this year I observed much less snow than in former times, until the last few weeks or so. I could see the grass for all but a few days this winter, however at 9:00 AM on April 6 I've a thin blanket covering everything. I expect it to be gone later today. I don't recall ever seeing snow in April here. Our river froze this year for only the third time since 2004. 50 years ago the annual breakup of the ice was a big deal, but it hasn't been an annual occurrence for some time. The Grand River melted about a month ago and the ensuing flooding lead some to remember their childhoods. It again has pockets of very thin ice. Without consulting any graphs I'd guess that we had a moderate winter, but are suffering a damn cold spring. The snow cover is definitely high this year. However, glaciers grow by the net remaining snow cover, the difference between winter snows and summer melt. Temperate glaciers tend to get more snowfall, but also get more summer melt. New high on 4/5. Looks like we may break the graph again? And Eurasia and northern hemisphere excluding mountains is going down. N. America is having really weird weather - but one swallow does not make a summer. Not yet time to make snowballs with Lamar Smith. Mass gain exceeds mass loss and you grow an ice sheet. We need more than 1.5m water equivalent in snow fall to grow an ice sheet. Blue ocean in the arctic mint get that much lake effect snow. NH snow cover has increased during the winter months, but decreased during the summer. The net change has been a slight overall increase. Well, we first need to see whether 2018 is an outlier, and how much longer than normal that snow will linger. Outlier we had a 4 standard deviation event followed by an over 5SD event in atmospheric angular momentum this winter. New normal? My take on how much longer it will linger is not very. If we get on the order of 1.5m of SWE then we can start thinking about year round snow/ice sheet. I don't know if we can have an ice-free Arctic due to AGW, while at the same time new continental ice sheets start to form. At some point all that extra precipitation starts to fall as rain instead of snow. High arctic snow 1.5m SWE and we rebuild the continental ice sheet. It is a question of chicken and egg: is excess oceanic heat leading to the ice loss? Is it atmospheric ridging? Or does the release of latent heat through the daily see-saw of ice formation / loss that must be occurring in this region due to the highest temps on record aid the blocking that then develops overheard? OK, so part of N. America is having a lot of snow. So did Eurasia. The graphs below show how while snow water equivalent was and still is several SD's greater than average, extent was and is within one SD of average, i.e. melt is delayed by a few days only, certainly less than a week. A study buried in Environment Canada somewhere dated 2016 says overall snow in Canada has trended down due to warmer winters. One will have to see the extent to which 2017-18 N. America snowfall increase is a trend or just another weird weather event. So, to be accurate, Eurasia had a snowy winter. Imagine that. And then, in the Spring, it will melt. I predict that, next winter, it will snow again. And next winter the ice will form and the following summer it will melt. If you are going to talk down to people because you don't understand how albedo works maybe you should stay on the other side of the forum? This kind of attitude re: snow falling/melting is inconsiderate & hostile to discourse. It is also especially stupid because all you do is the exact same thing but with sea ice instead of snow. If modeling is correct North America may still have a ways to go til peak....!!! I think modeling will trend more suppressed with the possible warming event in the mid-range. In any case even with the current look, snowcover over the southern tier will either be stabilized or building. Over the northern shield, it should only be building. The daily shows a slight gain, perhaps we are at maximum or just about there. If there is another surge I would be surprised, I think the modeling portends a continuation of current SWE or slight increase. Even with a continuation, the extant snow-water-mass across North America as of 4/15 will probably be about 2X what it normally is for 4/15. The ultimate impact of this will be continued snows into May and possibly June across some areas (IMO). As we get further into the warm season I believe the worsening albedo differential between Bering + Okhotsk and Hudson + Baffin will trigger continued enormous +500MB anomalies, worsening the standing wave pattern which has been manifesting since the end of February. The continued rise in SWE across North America is not merely coincidental with what's happening in Bering, it is a major side-effect (downstream winds over open water in April which then advects over continental snows = snow cannon). I think summer this year will come extremely late for certain parts of the Arctic and North America, namely, anything surrounding the Canadian Shield. Everywhere else is going to torch massively (already happening across parts of Eurasia). Maybe by late August and September the same will happen across North America but I think that even July could be unseasonably cold. The 12z EURO destroys Wisconsin, Minnesota, Michigan and the dense parts of Ontario/upper New England with a crippling ice storm, rivaling the worst in history. Cataclysmic would be an understatement. This is perhaps the most incredible model output I have ever seen! IF Bering ice drops below a certain threshold, maybe April snows beget May snows? Or do we have to wait til Beaufort follows?